Along with Saat Pake Bandha and Pratham Kadam Phool, Teen Bhubaner Pare makes a trilogy of 1960s films with Soumitra Chatterjee about a young couple who should have paid more attention to the red flags that popped up before they married. Saat Pake Bandha is the best of these films, combining the most interesting script with the most complex performances, and it's also the strongest statement about the risks of committing to someone with whom you do not share understanding and support (or even attempts at those things). Pratham Kadam Phool is the weakest: a snobby, unrealistic heroine with a suspicious, mama's boy hero and an uneasy final scene that indicates no real resolution of the problems in their relationship. Teen Bhubaner Pare is the story of Montu (formal name: Subir) (Soumitra Chatterjee) and Saroshi (Tanuja), who live on the same street but represent opposite sides of the tracks. His family is struggling, especially his next closest brother, and when not at his factory job dada Montu spends most of his time gambling, drinking, and loafing around the street with his similarly unoccupied friends (featuring the always excellent Robi Ghosh). After a credit sequence that is a tour de force of musical styles (Sudhin Dasgupta did the excellent music) over footage of 1969 Calcuttta (hear/see it here), he film immediately introduces the young men with the famous "Jibone Ki Pabo Na. "* In 2014, a film's hero being introduced in a (relatively) raucous song is standard, but in 1969 Calcutta, this must have been downright sensational. I've never seen anything like it. 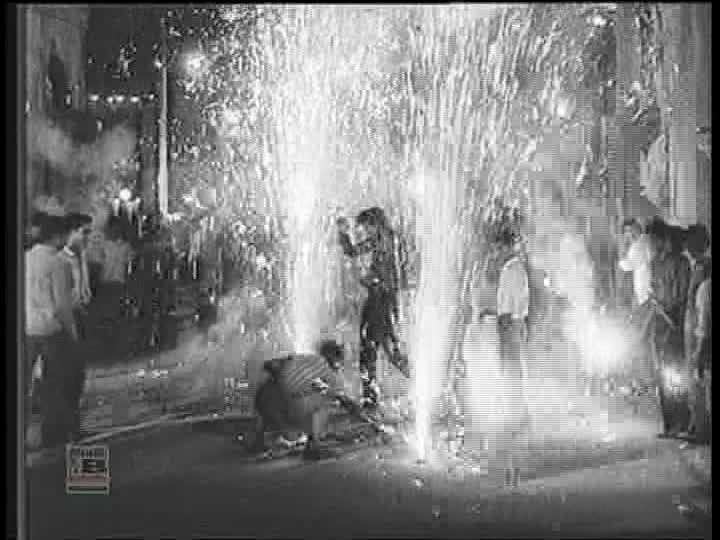 Not only is it full-on song-and-dance sequence (which are very rare in the Bengali films of this period that I've seen), but it's an unruly rock and roll dance in the middle of the street with several dozen guys shouting about sports (football, I assume?) and banging drums before singing about not knowing whether what they see is real or fake, pausing their song only to ogle Saroshi, a new elegant, educated schoolteacher on the block. Public, raucous, disruptive, rude, and questioning the order of things. After the song, they continue to shout at Saroshi in her house, and when she ignores them they call her "stainless steel." The film then shows a few moments of Montu's home life, where we see his family's falling status and his father's disapproval of how he spends his time and money. When his little sister asks where he's going, he replies, "If you don't ask me, then I won't have to lie to you about it." Later, when he finds his brother writing depressed poetry about there being no value in love or living, he throws away the paper angrily, saying that not being alive is impossible. Montu is immediately established as someone who makes bad choices but doesn't have much of a support system either. He's quick with his words but he doesn't do anything of value with them. He rejects his brother's bleak outlook but he puts no energy into improving his or his family's situation. Montu comes off almost as an Angry Young Man, except most of the time he's more perplexed and frustrated than he is full-on angry. What Saroshi does not initially see is that almost every time she rebuffs Montu's advances, he pauses to reflect on what she's said. His attempts to talk to her are egged on by his friends, but I do think he genuinely wants to get to know her—maybe she represents his internal sense that there's got to be something better in life than what he currently lives. 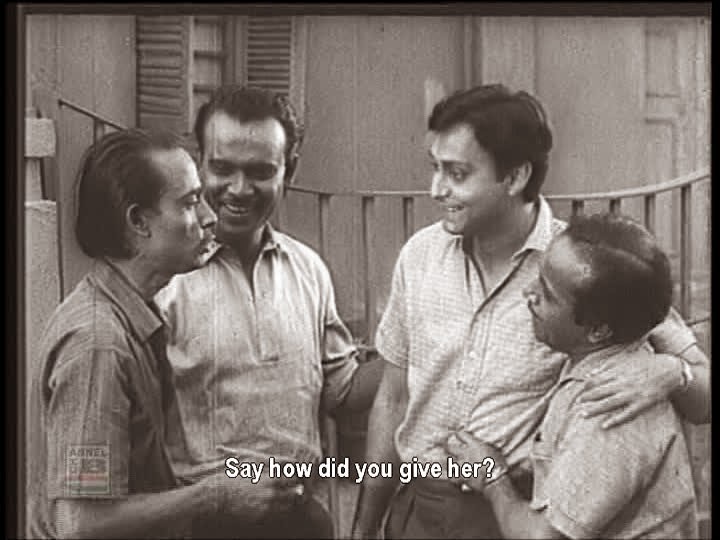 Soumitra and Robi Ghosh: my favorite filmi odd couple. Saroshi's insults of "Illiterate! Uncivilized!" clearly sting him, and there is a short sequence of him wandering around the city and then sitting by the river as the sun goes down, lost in thought, after which he wonders aloud to his friends whether they deserve such epithets. Like the aerial shots of the city in title sequence, these views remind us that Montu is well aware that there's more to Calcutta than the back lane he's stuck in. He also teases her for not giving him a chance to prove himself better than her insults—I love this exchange because it shows that a little part of him is always analyzing and hoping, even if he doesn't take those actions in exactly the "right" direction—and she eventually warms towards him after he takes care of an ill child during a Durga Puja scene. For Saroshi's, part I think she is genuinely drawn to to Montu because of his restlessness and refusal to completely accept things as they are. In some ways, he's a big kid, and she's charmed by his joy and affections. When he admits he always wanted to get more of an education than he had the chance to, she's a goner. He wonders if he's good enough for her, and she vows to bring out his full potential through education. He reacts badly to his friends teasing him about the lady taking him away, and her brother states his formal disapproval. Saroshi, in turn, disapproves of Montu's friends, refusing to be empathetic to their situation the way she is to Montu's and telling him that he has to chose either them or her. You can see where this is going: they get married, leaving their old neighborhood behind to set up a new flat on their own. Saroshi puts Montu on a very strict curriculum, allowing him absolutely no time with friends or hobbies. 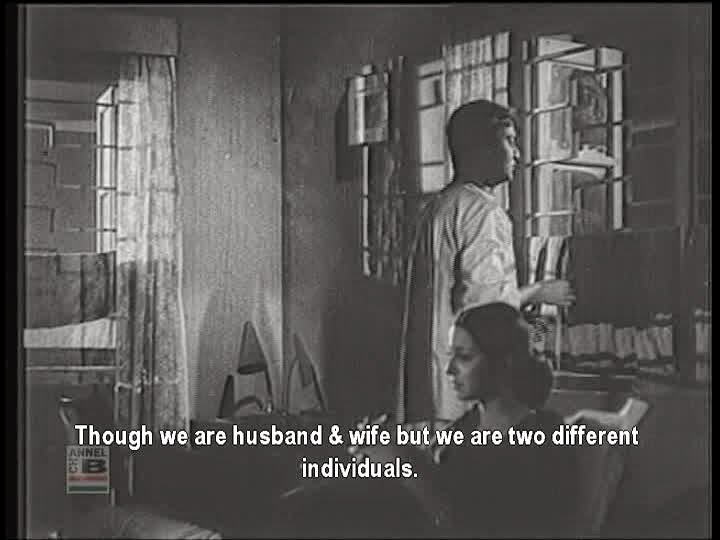 The rest of the film shows concurrent threads of their gradual socio-economic rise (witnessed by the improving decor of their flat) and cycles of her rebuking him for his attachment to aspects of his former life. I love films that depict the risks of marrying someone you hardly know, especially when the couple becomes isolated with no family support from either side. Saroshi and Montu have jobs but little else to help them in their new life together: she doesn't seem to have friends, she won't let him see his, and there is shockingly little evidence of mutual affection and respect within the couple. Both of them are foolish, if romantically hopeful, in the idea that Montu will change so drastically in order to live up to Saroshi's dream for him. She demands new ways of spending his time, new overall focus of his energies, a new career path, even new basic interests. A cruel streak arises Saroshi once she realizes how difficult this is going to be, withholding affection (and I don't just mean physically, though she does usually resist Montu's overtures—her attitude towards her husband is cold and snippy a lot). Saroshi is insistent and never apologizes, which makes her a flatter and completely un-empathetic character. She's consistent, but she's cardboard. Her all-or-nothing approach to his betterment is utterly unrealistic and destined to fail, so in turn she is always disappointed. She also communicates very little in words, yelling at him when he slips up and refusing to have a real conversation about his efforts and failures. Montu is the much more interesting and resonant character. He exists in a more nuanced reality, demonstrating thoughtfulness and emotions at a variety of scales about a variety of type of situations. He stomps off in a huff a few times, but he also has smiles creeping in during little tender moments (or his attempts at tender moments, anyway). He relaxes more. He sets his books aside and lounges, claiming space and an attitude of leisure that she not only does not allow herself but also disapproves of. And because Saroshi is cruel about his friends, not even caring that one eventually goes to jail and another is in the hospital, Montu gets to be the righteous one, explaining how society has done this to them, has put them in darkness with no love and only pain, and that people there drink to escape. Her response is "Stop lecturing me," which would be a valid complaint except that she has done little other than lecture him for their whole marriage (and scolded him for the majority of their acquaintance before that). I love that Montu actually says to her that she's like the Pygmalion story, not knowing what to do once her little created doll has a life of its own. Yet Saroshi, or life with Saroshi, has definitely changed him. It's a little bit like she's killing independent George: the man who danced in the street in the opening of the film is slowly disappearing. Another reason that the relatively flat character of Saroshi is disappointing is that the film puts so much of its emotional energy on just the lead couple, leaving only Montu as a relatable person. Although there are at least ten other named characters, they simply move across the central action of the film, providing new information or a new scenario for Saroshi and Montu to react against. Their world is very cozy or very suffocating, depending on how you look at it. They don't "collaborate" in life with anyone other than each other, and they do a very poor job of that. For example, when Montu becomes an instructor, he has a student with a wealthy and influential father who offers Montu some sort of government job that serves the country and will make his name and fame, but Montu refuses. That is too big a position and too big a change for the version of him we know in this story. This is a story about individuals, not the greater good. Interestingly, Saroshi balks when Montu talks about wanting kids—even the most socially acceptable (required, even) of things seems like a distraction from her plan and must be shunned. I've seen this movie twice and I'm still not sure whether Montu is fully satisfied with the changes in his life. He has made huge progress and risen into a different class while keeping his thoughtful nature intact, still showing flashes of his former feistiness and love of questioning. His wife is proud of him and he has made an informed, comfortable decision about his career. But on the other hand, his family is in tatters and he seems not to relate anymore to his old friends, offering them sympathy and help rather than his affection or time. 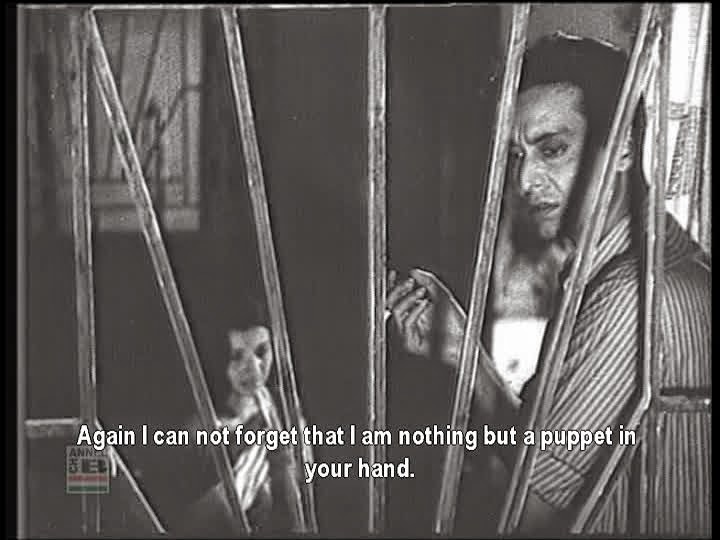 In a letter read out in voiceover near the end of the film, Montu says that he trusts Sarosihi's love for him is true because of her dramatic reactions when she fears their venture is failing. I can't quite believe this, simply because their relationship seems so cold and their dynamic so dominated by her years of disapproval and nagging. There's a line somewhere between tough love and the arrogance and disrespect of thinking you can fundamentally alter another person by playing off their affectino for you, and I think Saroshi has crossed it. Similarly, it's hard to imagine that Saroshi has has had anything to be happy about between the point they got married and the very end of the film, and even though much of her unhappiness results from her own rigidity and unrealistic expectations, I feel a little bad for her that she cannot find any pleasure in Montu's progression or in his fuller personality and character. Instead she seems nervous that her plan has been so successful that he will take his new achievements and run, leaving her behind. In the final scene of the film, he reassures her that he wants to stay together: "Whatever the good and genuine are in my life, they're because of you." She has—and always had—influence on him, but is this a good thing? It seems to me the costs of their hopes have been very high, and being the puppet in the hands of someone you love, and who says she loves you, seems corrosive. Necessarily Bengali professor's office. I love that in Calcutta's films of this era, it's the man who gets the makeover and that it puts him in, rather than removes, glasses. * The following point may be of limited interest, though I was blown away when I found out about it: in 2009, the Bengali film Jackpot included a remake of this song in what I think must count as an item number by mega-hero Dev. 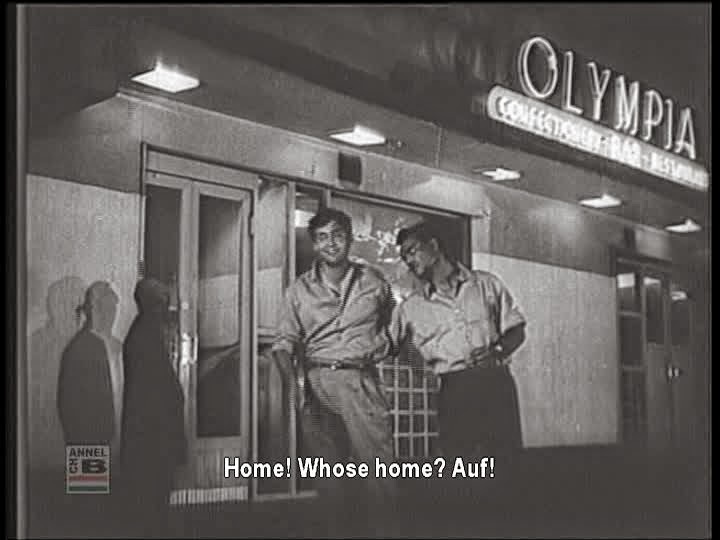 One of the reasons I'm so eager to find English writing about mainstream (-ish) Bengali films is that I'm desperate to know the chain of decisions and changing tastes that led from the original to this in the four decades in between. Wonder what Soumitra thinks of it? Also, here's a live version at the Calcutta Club: aunties and uncles go to prom. And another charming one by some guy with a guitar and a camera. Good writing in English on mainstream Bengali cinema is largely absent because it has largely been devalued in comparison to so-called art cinema of Bengal, particularly those of Ray, Ghatak and Sen. Sarmistha Gooptu has tried in recent times to offer a comprehensive picture of Bengali popular cinema (as you already know) but I find a lot of it superficial particularly the sections dealing with the stardom of Uttam Kumar and Suchitra Sen. You can read Moinak Biswas's writings. He has a piece calles The couple and their spaces in Ravi Vasudevan ed, Making Meanings in Indian Cinema (OUP). However, I don't know if there are any writings on the changes that have taken place between 1969 and the release of Jackpot. You have to gauge the changes yourself. 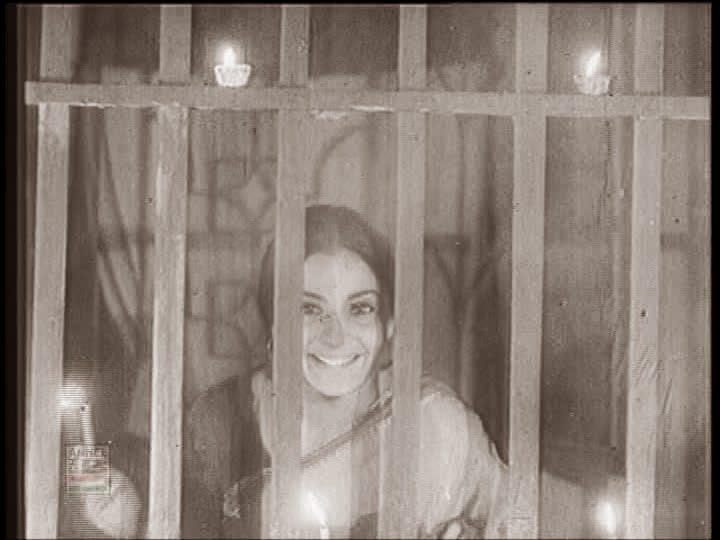 However, I feel that the 50s to the mid 70s was a period of Bhadralok cinema with all its strengths and limitations. From the middle of the 1970s, Bengali cinema became more influenced by Hindi cinema and started to lose its identity. 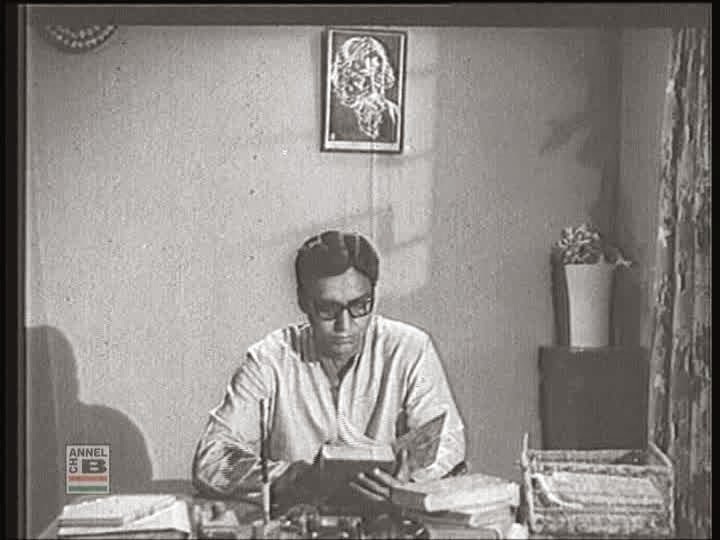 During the 1980s as Gooptu has rightly pointed out, Bengali cinema catered to mofussil audiences due to a number of reasons and the distinction between them and urban audiences became more stark. From the early years of the new millenium and the opening of multiplexes in malls, and the liberalization of the economy, films like jackpot and many others began to be made. This is just a general summary. I hope you will soon come out with a proper book on popular bengali cinema. Please shift your focus from bollywood and write something on this subject. Will eagerly wait to read it. On the lack of available English commentary on commercial Bengali cinema: I still can't believe JSTOR only brings up a handful of real hits for Uttam Kumar. And those articles pretty much just mention him in passing. 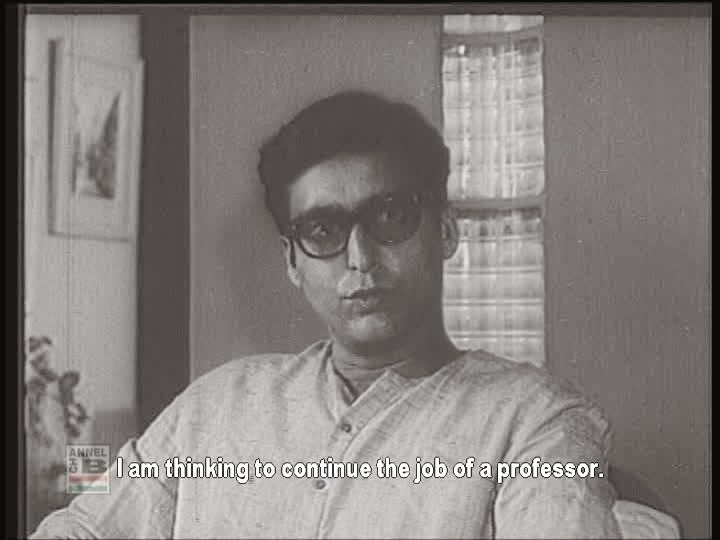 On Soumitra, I'm guessing there's a bit more, but I would also assume most is connected to his work with Ray. It's a bit disheartening, but it does make dipping into Angel's film stock kind of exciting. One never knows what will appear. On Teen Bhubaner Pare: I've watched bits of the film, but so far haven't seen with subs, so couldn't make any real judgments except upon Soumitro's FINENESS in it. I'm glad to hear it's better than PKP, because I found that one rather annoying. I mean, I liked what it tried to do, but that's about the best I can say about it. Bad writing or no, I don't think Tanuja's signature petulance helps matters in these films. She's nice to look at, but I have yet to see in her in a part in which I didn't wish she was replaced by someone else. Maybe Haathi Mere Saathi, but that's just so full of distracting animal activity, I don't know if it counts. Side note: I also enjoy these ill-advised marriage films, and I love what I've seen of Ajoy Kar's, so I think I'll be seeing Saat Pake Bandha sooner rather than later. I really liked reading your take on the film which I watched many years ago. Indeed, the only things that I remember are the two hit songs. I am also curious to know what prompted the monstrosity that is the remix from Jackpot. In an age when the Bengali films songs that I see on TV are crap, I guess, the producers want to ride piggyback on a song that thousands of Bengalis love and know. If I am not mistaken, the backing musicians on the original are the Goan jazz musicians who played on so many Hindi songs. As an aside that is indeed Olypub, so I am guessing you have been to Calcutta. I must watch the movie online just to check out that scene in Park Street. Thanks!